Operating on a VFD means there is a LOT of high-frequency distortion of the waveform, leading to imbalance in the magnetic circuit - which in turn leads to the development of shaft potential. If the shaft is higher potential than the ground plane, then current will flow - directly across the bearing, usually. So get a good grounding method (actual brushes riding on the shaft are by far the best over the long haul, in my experience). How do you know it's happening? The failure mode is scoring, cracking, or pitting on either the bearing surface or shaft journal (for sleeve bearings) or on the rolling element or race (for rolling element bearings). What speed are you now operating at? 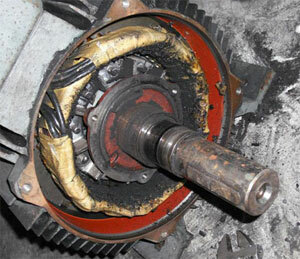 If too slow OR too fast, the bearing may be getting insufficient lubrication (result: overheating). The "too slow" speeds may result in insufficient air movement within the machine, which will also affect thermal performance of bearing. Where to put the non-locating bearing? There are two thoughts to this. One: The intent is to allow axial growth resulting from thermal expansion toward the ENDS of the drive train, since there's no provision to accommodate it within the train. This means putting the non-locating bearing outboard (away from the driven equipment). This also tends to keep the motor "fixed" with respect to the driven load, resulting in lower stresses at the coupling region. Two: The intent is to allow axial growth within the train (e.g. there's provision for that to happen, most likely in coupling design). This puts the non-locating bearing closest to the driven load and the "held" bearing at the outboard end. Where to put the shaft grounding? In my experience, by far the best results are obtained by grounding AT THE MOTOR DRIVE END BEARING. This effectively keeps any harmful currents developed by circuit imbalance in the motor from affecting the rest of the drive train - AND it protects the motor bearings from anything developed by the driven load. Don't think the source can come from the mechanical side? What about an extruder - where the "screw" rubs against a medium and generates static electricity? Or the drive shaft runs through a "curtain" of felt or other organic material - again, generating static electricity?